Banker horses are descendants from domesticated Spanish horses that were brought to America in 16th century by explorers and abandoned on the Outer Banks of North Carolina which is where their name "Banker" was derived. Banker horses were originally domesticated; however, since they were abandoned and left to fend for themselves, they've become feral. Banker horses can be found on the Outer Banks barrier islands of North Carolina's coast. They reside on Corolla Island, Currituck Banks, Ocracoke Island, Shackleford Banks, and in the Rachel Carson Estuarine Sanctuary. They feed on bulrushes, sea oats, poison ivy, and Saltmarsh Cord grass. Because of their poor diet, the horses on the Outer Banks are smaller than domesticated bankers that have been raised on farms. Banker horses are a small, hardy breed ranging from 13 to 14.3 hands in height and weighing from 800 to 1000 pounds. They have a broad forehead, a profile that can be straight or slightly convex, a long mane, a deep narrow chest, a short back, a sloped croup, and a low-set tail. Barker horses have smooth movement and long gaits. Unusually, they have only five lumbar vertebre rather than six like most other breeds. Common colors are bay, chestnut, dun, bay, buckskin, pinto, black, and brown. Banker horses have a docile temperament, and are very willing to learn. Because they are so docile, Banker horses taken from the wild are sometimes used as mounts for children. They have also been used by several mounted patrols and ridden in parades. There are presently about 400 Banker horses inhabiting the Outer Banks of North Carolina. Overseeing of the horses began in the late 1980s after the islands became overpopulated with horses, causing malnourishment and death to several horses. 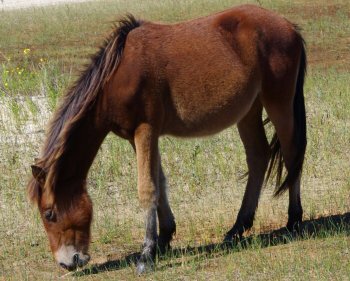 The National Park Service, the State of North Carolina, and several private organizations now look over the Banker horses to prevent overpopulation, overgrazing, inbreeding, and monitor them for diseases. Their number is controlled with birth control and adoption.